OCHS Class of 58 – Hard to believe it has been 50 Years!! 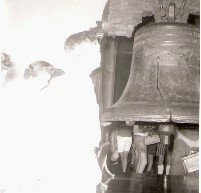 In the 40’s and 50’s in Oconee County, the senior class would take a Senior Trip to Washington DC and New York City, with a stop in Philadelphia to see Independence Hall. My Class of 1958 consisted of 59 members and we were one of the last classes that were able to make the trip. Classes would have fund raisers to pay for the trip. One was the concession stand at basketball games. 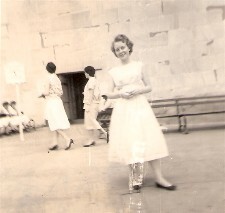 Another was admission to the Senior Play and also Stews, Mulls and other fundraisers. Some classes sold candy at school etc. This funding source allowed many students to go on the trip who could not have afforded it otherwise.The Class of 58 was successful enough in fundraising that we were able to donate funds to purchase a sign for the new High School on Mars Hill Road. My class was the first Junior Class at the new OCHS and was the last Sophomore Class at Watkinsville and Bogart High Schools. There are countless memories from our High School days. It was a time of innocence in the nation. Dwight Eisenhower was President and there was no war. Oconee County was a rural county with a less mobile population. Some of the seniors started First Grade together and went all the way through school as classmates. Friendships and bonds were formed that only grow richer as years go by. The Class of 58 performed Our Town by Thornton Wilder as our Senior Play. It involved most of the class and had a camaraderie that is hard to describe. Many played basketball on the Girls and Boys teams. In those days, there was no football and basketball was the center of sports and social life. The old gym at Watkinsville and the one at Bogart had countless nights of competitive ballgames. The bleachers were full and folks were excited. Bogart and Watkinsville games had extra tension and rivalry. 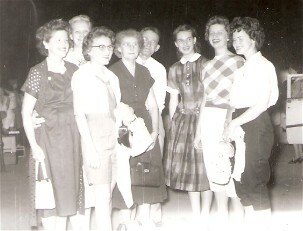 Our Class hosted the OCHS alumni party at the Watkinsville Gym in June of 1959. After that we started holding annual reunions and have met every year since we graduated. Sometimes it was a picnic and other times, we would go to special facilities. We have met in the Community Centers at Watkinsville, Bogart and Farmington and also at Charlie Williams Pine Crest Lodge. Along the way, we have lost 9 members to death with the first occurring in June of 1987. In some ways, a death is like the loss of a family member. Most of us keep up with each other and attend funerals and remember each other at times of sickness. Those events have become more frequent since we reached “Senior Citizen” status. Many of us have gone onto hold public office, travel and several are millionaires. However, most of us would say our favorite “Club” was and is the Class of 58! 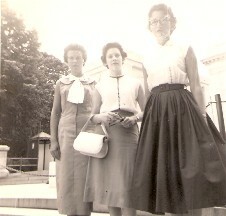 The 1958 O.C.H.S. Senior Class has finally realized the eagerly anticipated experiences of graduation and the Senior Trip. 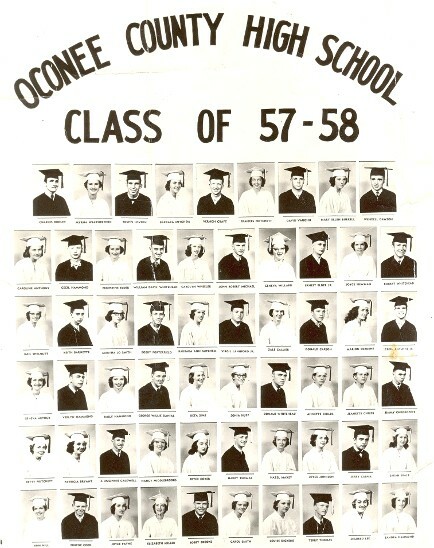 The 1958 class was the second to graduate from Oconee County High School and the largest ever to graduate from an Oconee school. The class holds much pride in its members who were active in all school activities and couldn’t resist a feeling of sadness at the time of parting. One of the ambitions of this class was to follow faithfully as individuality allows the traditions and standards of former O.C.H.S. classes. We sincerely hope that we haven’t fallen short and that our record will be worthy of the emulation of future classes. Last week we visited Washington, D.C. and New York City for our long awaited class trip. We spend two days and two nights in both cities and viewed many points of interest. As we toured famous places in Washington and New York, some of the things we studied in school began to come to life. In Washington some of the things we saw were the Washington, Lincoln, and Jefferson Memorial, the Smithsonian Institute, the Archives Building, the Capitol, the White House, Bureau of Printing and Engraving, the Tomb of the Unknown Soldier, and Rep. Paul Brown gave us tickets for a boat ride down the Potomac River to Maryland. We enjoyed this trip very much and appreciate Rep. Brown’s kindness to us in Washington. On the way from Washington to New York, last Wednesday, we stopped for lunch in Philadelphia and visited Independence Hall. In New York, some of the sights we saw were Times Square, Radio City Music Hall, the Empire State Building, the Statue of Liberty, St. John’s Cathedral, the tall skyscrapers, and the homes of many famous people. Anyone watching Dave Garroway’s program, “Today” might have seen some of us standing outside his window. There were many places and things we saw. Almost every minute was filled with some unusual experience which we’ll beable to think about for a long time to come. This trip was an experience that we’ll never forget. Our last week together was both enjoyable and educational. Quite possibly many of us will never see some of the places again and it was very fortunate for us to make the trip as a class. Once you have seen these places, we think one’s pride in Oconee County is enhanced and that dream of those big cities hundreds of miles away becomes a memory of an experienced reality. .We are grateful to the many people who helped us raise the money for the trip and the new sign to be put at the High School this summer. When we closed our bank account at the end of the summer, we had the needed amount, almost $,000. To the many friends of the class who worked on projects but were unable to make the trip, and to the Oconee Enterprise for printing articles for us, we thanks for your cooperation, encouragement, and aid in making the trip possible. There are several teachers to whom we are especially indebted for their efforts on our behalf.Again we’d like to say a big thanks to Mrs. Lawrence Curtis for coaching the senior play which we’ll always remember and be proud of. We thank Mr. Clarence Thomas and Mrs. Arnold DelaPierre who worked diligently with the class in its many projects.We thank Principal Henderson and Supt. Cain. 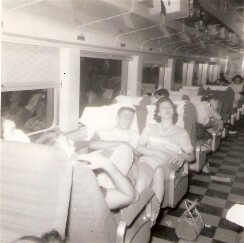 They were very cooperative throughout the year and along with their wives accompanied us on the trip as our chaperones. pleasant experiences and cherished memories of our high school days..
WATKINSVILLE, GA: The Rev. Hugh McKee of the Wesley Foundation, Athens, Ga., will deliver the commencement sermon at the Oconee County High School Sunday at 11 a.m. T. Hamp McGibony of Greensboro, will speak to the class on Monday at 8 p.m.
Ernest Elder, son of Mr. and Mrs. L. E. Elder, is first honor graduate with Myrna Weatherford, daughter of Mr. and Mrs. Edgar Weatherford, as second. There are 59 candidates for diplomas this year. They are: Caroline Anthony, Cecil Antwine, Geneva Arthur, Keith Barnett, Geneva Arthur, Keith Barnett, Sarah Beale, Bobby Brooks, Pat Bryant, Mary Ellen Burrell, Mack Caldwell, Gale Callier, Donald Carson, Jerry Casper, Annette Childs, Jeanette Childs, Jimmy Christopher, Eugene Cook, Joyce Coker, Vernon Craft, George Willie Daniel, Wendell Dawson, Louise Dickens. Charles Dooley, Ernest Elder Jr., Ernestine Elder, Cecil Hammond, Emily Hammond, Sandra Hammond, Verlyn Hammond, Ann Hill, Sonia Huff. Joyce Johnson, Virgil Langford, Mildred Lee, Edwin Lovern, Hazel Maxey, John Robert Michael, Nancy Middlebrooks., Elizabeth Miller, Barbara Ann Mitchem, Barbara Helen Mitchem, Joyce Newman, Marion Osborne. Betty Joyce Payne, Bobby Porterfield, Betty Pritchett, Frances Pritchett, Gail Shelnutt, Reta Sims, Carol Smith, Jo Smith, Harry Thomas, Ted Thomas, David Vaughn, Myrna Weatherford, Carolyn Wheeler, Bobby Whitehead, Donald Whitehead, William David Whitehead, Geneva Willard. On June 8 the senior class leaves for a trip to Washington. D.C. and New York City. They will return home on June 14.